This story was updated at 1:32 p.m. ET, Jan. 19. LITTLETON, Colo. – NASA's Stardust-NExT spacecraft is hoping for sweet science on Valentine's Day when it makes a close flyby of the comet Tempel 1. 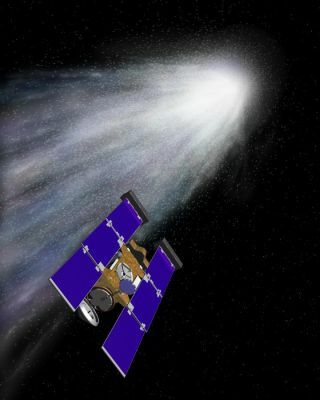 Launched in February 1999, the industrious Stardust spacecraft zipped by comet Wild 2 in January 2004, flying through the comet's coma and snagging particles from that celestial wanderer. Two years later the probe parachuted its sample-carrying capsule into the Utah Test and Training Range in the Utah desert. Fast forward to another place in space and time. The still-operating craft — renamed Stardust-NExT, for "New Exploration of Tempel 1" — is en route to inspect Tempel 1, a task begun by NASA's Deep Impact spacecraft six years ago. Stardust-NExT's job is to obtain high-resolution images of the comet and, it is hoped, the crater that was made when Deep Impact's impactor slammed into Tempel 1 in July 2005. At the time, the stirred-up debris cloud obscured the view of any newly formed feature. Here at Lockheed Martin Space Systems, all is in readiness for the upcoming encounter. The aerospace firm has been NASA's industrial partner for Stardust throughout its two-mission life, having designed, built, integrated and tested the spacecraft. Company engineers monitor the health and safety of the spacecraft, develop and send commands over NASA's deep space network, and plan mission activities. The voyage of Stardust from blueprint to space traveler has been a 15-year personal journey for Allan Cheuvront, Stardust-NExT program manager at Lockheed Martin Space Systems Co.
"I'm confident that we'll be in good shape. We'll get the images and we'll provide brand-new science," Cheuvront told SPACE.com. "This has been a remarkable, robust spacecraft. It has done everything we've asked it to do and more." On encounter day, the company's Mission Support Area is to be staffed by a 15-person team. Stardust-NExT is to scoot by comet Tempel 1from roughly 125 miles (200 kilometers) away. During that close-up call, and in all of five minutes, 72 images are to be taken for download to Earth, Cheuvront said. Will the spacecraft spot the crater shaped by Deep Impact? "Scientists don't understand the rotation mechanism of the comet, why it changes, what causes it to change, and how to predict that," Cheuvront responded. "We did everything we can to put ourselves in a position to get a picture of the crater. But there are so many unknowns … we have to be lucky. "Hopefully the comet will cooperate," he added. Eager to see Stardust in Comeback Kid mode is Donald Brownlee of the University of Washington, who served as the principal investigator for the spacecraft's primary mission. "It is great to have Stardust do another encounter," Brownlee told SPACE.com via e-mail. "We are really looking forward to seeing new and old areas of Tempel 1 — in stereo — and imaging the crater." "The dust-impact instruments should produce most-interesting data," he added. "The mysterious and unexpected bursts detected at Wild 2 were interpreted to be product of the disintegration of larger debris." This was beautifully corroborated, he pointed out, by the spectacular images of comet Hartley taken by Deep Impact last November that observed large debris leaving the nucleus. "I wish we were bringing back samples from the Valentine Day flyby!" Brownlee said. Even as Stardust-NExT closes in on its target, it is a bittersweet time for Lockheed Martin's Cheuvront. "The low fuel light is on. Unfortunately, there's no gas station for us to go through," he said. Years ago Stardust engineers were confident that an extended mission would get the go-ahead. "So when we said goodbye to it in 2006, it wasn't really saying goodbye to it. It was more like, 'We'll see you later,'" Cheuvront recalled. By the time of the comet Tempel 1 encounter, the spacecraft will have amassed 12 years and one week of flight. Little fuel is left. Its aging batteries are not quite what they used to be. "It's the final hurrah," Cheuvront said. "This is it. This time around it's goodbye." Still to be green-lighted by NASA headquarters, Stardust is headed for a purposely scripted type of space euthanasia. It will continue to take images of the comet after its encounter until the longing looks no longer yield imagery of scientific value. Pulling the plug on the spacecraft will be next. A final propellant burn of leftover fuel, setting in motion such items as shutdown of the spacecraft's transmitter, is under review. The final farewell could occur in March, or perhaps in late April. "When we lose it, it will probably be oscillating. It will be fighting to control itself. There's speculation on what happens after that. Nobody really knows for sure," Cheuvront said. The spacecraft will silently slip away on its heliocentric (sun-centered) orbit. But even in its death throes, Stardust can cough up some valuable information. It turns out that engineers have a tough time precisely gauging just how much leftover propellant is onboard an end-of-life spacecraft. While computer modeling is helpful, Cheuvront said that monitoring the true exhaustion of Stardust's fuel load can help other extended missions in the future. Stardust's sayonara puts it at around 3.6 billion miles of space-trekking over its 12 years, after starting out with some 22 gallons of fuel onboard. About seven-tenths of a gallon remains. The spacecraft's 16 thrusters have collectively fired on the order of 2 million times over its mission. "In some ways, it is like losing a loved one. Stardust has been part of my life and my family for so many years. So for us, it's like losing a family member," Cheuvront concluded.